It’s time for part three of my entry concerning June’s RPG Blog Carnival. This month the carnival topic was picked by Phil over at Tales of a GM and the theme is “Summerland.” Summertime is all about vacation for many of us and that can include adventurers! In my first two posts, Summertime Downtime and Summertime Downtime 2, I provided some new downtime options in addition to the ones in the Player’s Handbook and Dungeon Master’s Guide for fifth edition Dungeons and Dragons. You can now grab those options in a PDF on the Free Game Resources section of this site along with plenty of other resources for your game like monsters, D&D fifth edition rules modules, backgrounds, spells, magic items, and more. In this post I’m continuing the downtime theme, but instead of providing more downtime options I’m going to give you some advice for running downtime between adventures at the table. Many GMs want to tell stories about world-­shaking events with villains and forces who are not off the clock, so the PCs can’t be either. If the adventurers take a year to build a castle, evil takes over the land or worse yet, evil chills out for a second because the DM wants the PCs to be able to build their fort and the story’s sense of urgency is gone. So there is no space between adventures for the PCs to pursue downtime activities. The bard never gets to start his college and the fighter never gets to spend nights gambling with hard won treasure. 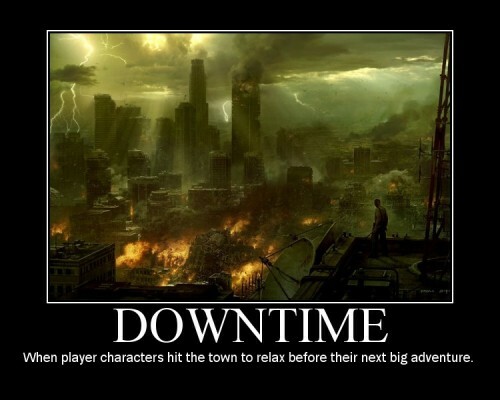 To many it may seem fine to ignore downtime activities, but finding a way to fit them into your game will allow each player more role­-playing time and create a richer story within your world. It’s worth going through the trouble of fitting in occasional non-adventure time for your players to explore their characters’ everyday lives and it allows the players to interact with the world they’re trying to save. There are ways to have your cake and eat it too. Downtime activities and an urgent, world­-shaking campaign story arch can go together. Here are a few times the DM can allow more downtime into a game, especially if that game is one with a fast-paced overarching story. Sometimes PCs spend days, weeks, or even months traveling from one area to the next with the occasional random encounter thrown in. All that time is often glossed over at the table, especially if that world is as big as Toril, Eberron, or Canus. These travel opportunities are the perfect place for downtime activities, especially if the PCs are part of a larger caravan or ship. Suddenly a boring ride through the plains is a chance for a PC to learn to play an instrument, sow rumors amongst the caravan, go carousing, craft an item, or recruit members of an organization. A PC may want to take time to do some research into the name of the demon lord the party has been hearing on the lips of every cultist they’ve come across. A wizard may have to build an item, magic or mundane, that will aid the party against a threat looming over the land. The bard may want to stop and sow rumors about a villainous overlord to his people or gather supporters to form an army to takedown a dragon. If there’s a piece of the main story only one character can tackle during downtime, the rest of the party is free to do whatever they like. Be sure that this burden doesn’t always fall on the same PC so that everyone gets a turn affecting the main story and likewise a turn doing whatever they want. Of course there are other instances of downtime being part of the plot. Perhaps a villain fakes death and lets the PCs think they’ve won the day for a time, allowing the PCs a break before the villain comes back stronger! The villain’s trail could just go cold and the PCs have downtime to kill until signs show evil has returned. Maybe the PCs have to lay low in a city or town and wait for a messenger or patron until they can continue their quest. Even Batman takes breaks when there is no crime to fight. If a character dies, the other PCs might need to spend some time looking for a new adventurer to take the deceased’s place or find a diamond and spellcaster powerful enough to bring their comrade back from the dead. This might require the full party’s efforts, but in most cases it does not. While someone works on filling the gap in the party, the rest of the team is free to spend downtime however they like. Some world-shaking events take years. A campaign driven by an overarching story does not need to be so urgent. Perhaps a campaign’s villain is only active during certain seasons or parts of the lunar cycle. Maybe the villain bides time between schemes, lying low until the heat dies down, or spending evil-won spoils during evil downtime. What? Evil has to build castles and carouse too, ya know. Perhaps the evil scheme the adventurers are trying to thwart takes time. It’s not easy to construct a doomsday device, build an undead army, unravel the mysteries of a complex tome, or become a lich. While the baddies are doing their thing, the adventurers have some time to do as they please without sacrificing the importance of your main story’s events. During downtime it can be easy to get caught up in what one PC is doing while ignoring the rest of the characters for a long time. If this kind of thing is happening at your table, think about instituting the downtime round. This rule makes sure everyone gets a fair shake when they’re chilling betwixt adventures. Before discussing how each PC spends downtime all players roll initiative. Then in initiative order downtime turns are resolved. Each player has 3 to­ 5 timed minutes (determined by the DM) to explain what they did during the downtime and resolve it using the appropriate rules for the downtime activity. Usually only one downtime round is needed. If some PCs need more time to resolve their actions, their turn still ends when the timer goes off and then there is a second downtime round which they can use to complete their downtime activity. There are only two downtime rounds total so PCs need to wrap up their activities by the end of round two. It’s time for part two of my entry concerning June’s RPG Blog Carnival. This month the carnival topic was picked by Phil over at Tales of a GM and the theme is “Summerland.” Great topic! Since summertime is all about vacation for many of us, I decided to provide some new downtime options in addition to the ones in the Player’s Handbook and Dungeon Master’s Guide for fifth edition Dungeons and Dragons. In my previous post I showed off the downtime activities of creating a cover identity, making contacts, and committing a petty crime spree. In this post I’ll be giving you a look at building an organization and buying a magic item. A character can spend downtime between adventures creating and building the membership of an organization. The organization could be a guild of thieves or mercenaries, a church, a collective of magic users, a group of activists, or anything group of people with a common cause. Work with the player to come up with a mission statement for the organization. This statement should begin with the word “to” followed by a verb. “To kill dragons for gold,” “To uncover political corruption,” and “To spread the light of Apollo,” are all examples of organization mission statements. To start the organization, the character must have a place for members to meet and spend at least thirty days and 100 gp recruiting new members. This time need not be spent consecutively. At the end of the thirty days the organization is established and the character has recruited ten members to the organization and makes a DC 15 Charisma (Persuasion) check. For every 1 the check succeeds the DC, another recruit is added to the organization. Once the organization is established, the PC can spend downtime recruiting new members. Every day of downtime and 5 gp the PC dedicates to recruiting members adds another member to the organization. At the end of a period of downtime spent recruiting members, the PC makes a DC 15 Charisma (Persuasion) check. For every 1 the check succeeds the DC, another recruit is added to the organization. Once the organization is established, the PC can spend downtime assigning jobs to recruits to gain money for the organization. Every day of downtime the PC dedicates to assigning work (such as collecting donations, dues, contract fees, etc.) the PC earns 1 gp per recruit in the organization. The rest of the funds collected go to upkeep the organization. While the PC is away from the organization the PC can order the organization to recruit new members, earn money, or both. The organization is less effective without the PC actively leading it, so it only recruits two recruits a week if ordered to focus on recruiting, only earns 1 sp per member per day if ordered to focus on earning money, or recruits one recruit a week and 1 cp per member per day if ordered to focus on both. It is up to you as the DM if the organization can be of further help to a PC. Think about the organization’s mission statement. A network of spies can provide the PC with intel, while a mercenary guild could provide soldiers for storming an enemy castle. In most worlds few people have magic items and even fewer are willing to sell them, but there are those out there who occasionally come an item for which they have no use. A character looking for a magic item can spend downtime searching for a buyer. This downtime activity can only be performed in an area where the character can find lots of other adventurers or wealthy folk like a city or guild hall. Legendary magic items and artifacts cannot be bought during downtime, since these items are so rare and priceless. The character must make a DC 20 Intelligence (Investigation) check to find a seller of an item with a generic description, such as “a magic sword.” If a specific magic item, such as “a sword of wounding,” or an item with a specific ability, such as “a staff which lets the wielder cast fireball,” is desired, the character must make a DC 25 Intelligence (Investigation) check to find a seller for the item. On a failed check, no seller of the item is found after a search which lasts 10 days. On a successful check, a seller of the item is found after a number of days based on the item’s rarity as shown in the Purchasable Magic Items table. If the character wishing to buy a magic item provides a generic description, you decide which specific item is available for sale. Because of the research and investigation required, a character can only look for one magic item at a time. If the PC finds an item for sale, the player rolls on the Buying a Magic Item table, applying a modifier based on the item’s rarity, as shown in the Purchasable Magic Items table. The PC also makes a Charisma (Persuasion) check and adds that check’s total to the result. The subsequent total determines the seller’s final sale price of the item. You determine the seller’s identity. Sellers can be adventurers, wealthy collectors, or a more nefarious individual like a fence or thief. A seller could be someone trying to swindle the character by selling a mundane or cursed item. If the seller is shady, it’s up to you what the consequences of the sale are. *Apply this modifier to rolls on the Buying a Magic Item table. 20 or lower A seller offering ten times the base price. 21 – 40 A seller offering four times the base price. 41 – 80 A seller offering twice the base price, and a shady seller offering the full base price. 81 – 90 A seller offering the full base price. 91 or higher A seller offering half the base price, no questions asked. Hey do you want these downtime activities to have and hold forever and ever? Well you can grab them in a PDF if the link below. If you want to grab it later you can head on over to the Free Game Resources section of the site where it will live forever alongside plenty of other resources for your game like monsters, D&D fifth edition rules modules, backgrounds, spells, magic items, and more.